Newbury & Hobbes are back and this time in comic book form. As the book series hits its 10th anniversary, author George Mann along with artist Dan Boultwood bring this world to vivid life. For those of you unfamiliar, Sir Maurice Newbury is a gentleman “investigator for the crown,” and Miss Veronica Hobbes is his assistant. Together, they solve mysteries in the steampunk-infused world of Victorian London. And now having solved numerous cases and defeating countless foes together, this may be their toughest, and most dire, case yet. After finding a mysterious cab sunk in the bottom of the ocean, a mysterious, mutilated corpse is located in the trunk and investigated by the police. With no leads, they call upon Newbury and Hobbes, in the hope that they might be able to help them solve the case. It slowly becomes clear that they aren’t just messing with any mad man, but one that has haunted them before. As the mystery unravels, they are forced to face their past, as well as figure out a way to stop this sinister foe, before it’s too late. From masked skull villains and explosive human experiments to the sewers of London, there is never a dull moment in the lives of Newbury and Hobbes. 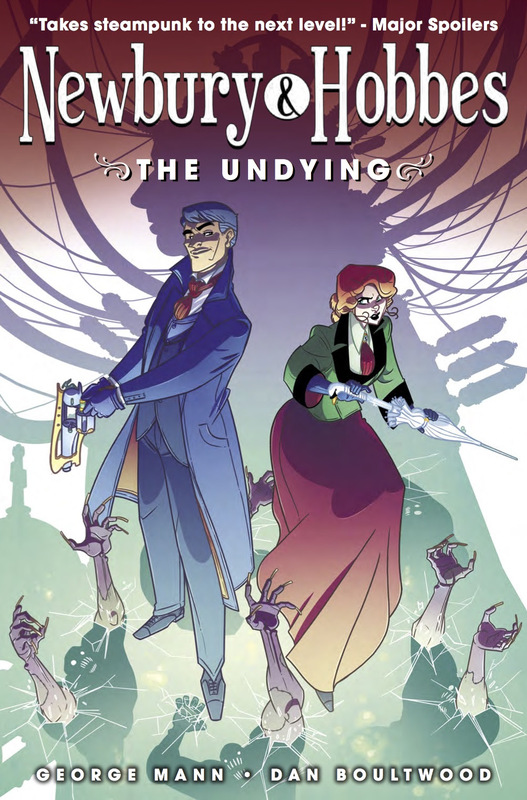 “The Undying” is a steampunk adventure that any fan of the genre should love. It has action and adventure and is filled with horrors you could never imagine. The writing by George Mann is fantastically intricate and mysterious. It’s like reading a Sherlock Holmes novel, but if Holmes was fighting robots in human suits and discovering a whole race of modified humans underground. Oh, and if the queen was a weird, robot, human hybrid. It’s just that kind of story. And it’s great. I was overjoyed reading the book and being reminded of the Don Bluth and Disney films of my childhood. Although it was a bit darker and dangerous than those, it was a time when animated films could be much more daring. And artist Dan Boulwood has captured that feeling perfectly. I’m not sure if that was what he was going for, but it’s not a bad thing. It’s an enduring aesthetic, and I loved it. The Newbury & Hobbes series of books have been on my reading list for a long time. After finally getting a taste of the world with “The Undying,” I’m ready to dive in and go read the novels. If they are anything like this collection, I know it’s going to be a great time. Go read this book!